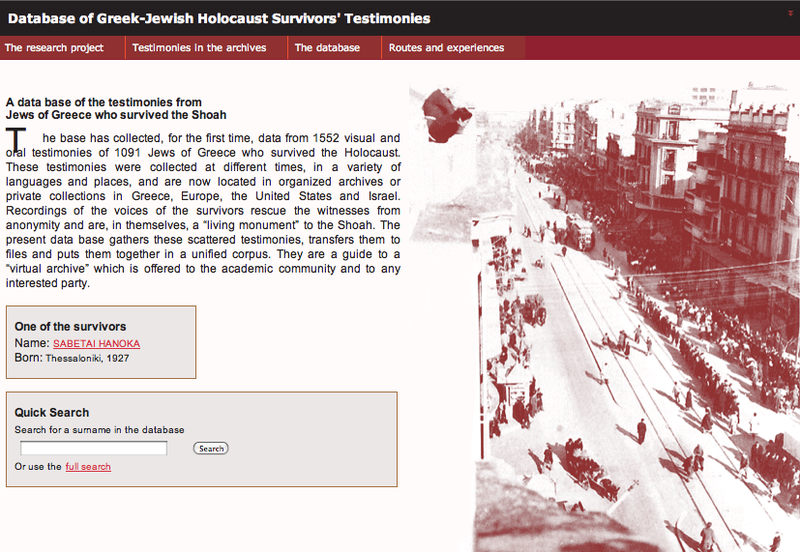 The Database of Greek-Jewish Holocaust Survivors' Testimonies is now also available in English. The database gathers for the first time data from 1,552 audiovisual testimonies of 1,091 Greek Jewish survivors of the Holocaust. These testimonies were collected in different time periods, languages and places and are today stored in several archives in Greece, Europe, the United States and Israel. The database catalogs data from all these scattered testimonies. It constitutes a guide to a "virtual archive" which is offered to the academic community and to every interested citizen. The database was designed and constructed by historians Rika Benveniste, Anthony Molho, Pothiti Hantzaroula, Yorgos Antoniou and Paris Papamichos-Chronakis and webmaster engineer Themis Dallas. The Greek-language version was financed by the John S. Latsis Public Benefit Foundation as part of the research program “From the Inter-War Period to Reconstruction (1930-1960). The Experience of the Jews of Greece in Holocaust Audio-Visual Testimonies”. The English-language versions of the database and the website were partly financed by Rothschild Foundation (Hanadiv) Europe. The website and the database are hosted by the University of Thessaly.